Anniversaries are a celebration of important past events in our lives. No celebration is complete without Flowers. The most important and widely celebrated of all kinds of anniversaries is the Wedding Anniversary. 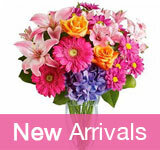 Anniversary Flowers symbolize the romance in your relationship. You can give a box of luscious, handmade chocolate truffles or a cuddly bear, but the celebration of love is not the same without a beautiful Flower Arrangement. Your wedding anniversary is the day when you are reminded of the bond that keeps you close. Fresh flowers are the best way to make the day special for your loved one on your wedding anniversary. 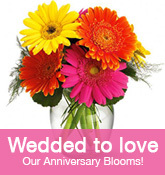 Every year renew your vows with a beautiful Anniversary Flower Arrangement. Send an anniversary flower arrangement to your partner to show how much he/she means to you. Give an Anniversary flower arrangement to celebrate your love, and your future together. Whether it is the first anniversary or a celebration of 50 years of wedded bliss, a beautiful Anniversary Flower Arrangement is the only way to celebrate the bond. Your Anniversary Flower Arrangement will speak volumes and best convey your message. You can give a an elaborate traditional arrangement with romantic roses or a delicate arrangement of flowers that will let your special someone know you care. For the wedding anniversary of a friend or a loved one, buy an anniversary flower arrangement online. Have the arrangement delivered to them and imagine their delight and touch their hearts. Send an unforgettable anniversary flower arrangement. 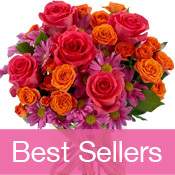 Give your wife a touching surprise on your wedding anniversary - send her an arrangement of her favorite flowers. Your Wedding Anniversary Flower Arrangement for your partner or loved ones can include the flowers that symbolise the message you want to convey. Refresh your memory on the Meanings of Flowers and order an arrangement online with the flowers that send a special anniversary message. When choosing flowers for your parents' or friends' anniversary, find out which are their favorites. A few, sensitively asked questions will make your anniversary flower arrangement that much more appreciated. A romantic anniversary flower arrangement will say it better than words. A flower arrangement fulfills your wife's sense of being appreciated as a woman. Giving a thoughtful flower arrangement as an anniversary gift for your parents or friends shows them how much you also cherish them. Your partner will love fresh flowers. And even more than receiving them is how you present them. Sending a gorgeous flower arrangement will add a romantic touch to your special day. Come home with a beautiful flower arrangement for your spouse. If you still remember the flowers on your wedding, order a wedding flowers arrangement online with the that flowers adorned your wedding! This will show your partner how very special the day is for you. Other anniversary flowers that can be added in your Wedding Anniversary Flower Arrangement are Lilies, Irises, Daisies, Carnations, Asters, Alstromeria and Snapdragons. Balloons can be added to liven up the anniversary flower arrangement. Send a romantic anniversary arrangement of long-stemmed roses, the classic your wife will always love receiving. An Anniversary flower arrangement will convey the deepest feelings of your heart. The beauty of love and the delight of receiving flowers from the one you love are inseparable. When most people are asked about their most romantic moment they will associate it to a time they received flowers. A wedding anniversary is the best time to rekindle the romance in your marriage by sending an Anniversary Flower Arrangement.